Peter is a talented ceramics professor at Central Oregon Community College (COCC). He’s an exacting professional and has been teaching at COCC for over 14 years. He often shows his work at Oregon Potters Association’s Ceramic Showcase in Portland, ClayFest in Eugene and ClayFolk in southern Oregon as well as galleries in the Northwest. • What makes up a glaze? 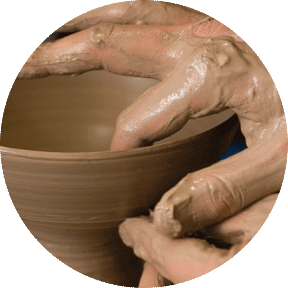 • How do you adapt glazes to different firing temperatures? • How do you expand the possibilities of a favorite glaze? • Understanding the glaze core can help you make sense of different glazes at different temperatures. Peter is a talented ceramics professor at Central Oregon Community College (COCC). He’s an exacting professional and has been teaching at COCC for over 14 years. He often shows his work at Oregon Potters Association’s Ceramic Showcase in Portland, ClayFest in Eugene and ClayFolk in southern Oregon as well as galleries in the Northwest. His work is in numerous collections and is featured in Lark Books 500 Figures in Clay. He has also participated as a juror in a number of shows including Art in the High Desert.